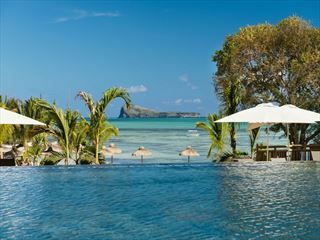 Renowned for being one of the most loved family resorts in Mauritius, we feel this elegant resort is the perfect way to introduce the whole family to a laidback island lifestyle. Nestled between Trou aux Biches and Grand Baie, you’ll be greeted to the most sensational views of the northern islands. 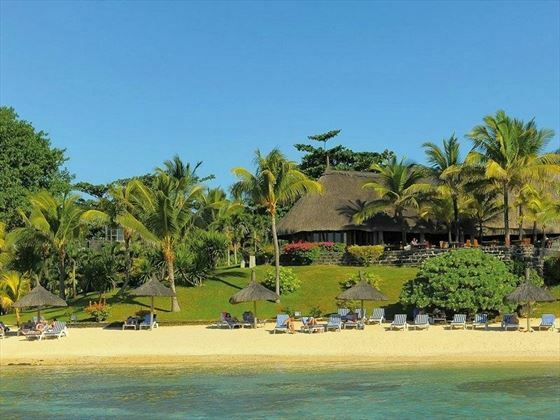 Perched on a historical peninsula, we love how the resort gives a nod to Mauritius’ historical past, featuring the ruins of a lighthouse and fortress within the 17-acres of luscious, tropical garden. 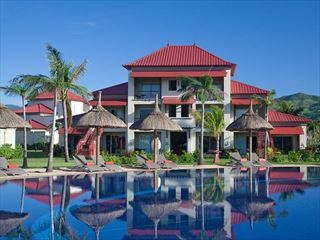 When strolling through the gardens, you’ll also find tranquil cascading pools and water features, as well as a wonderful main pool where the family can sunbathe and swim. 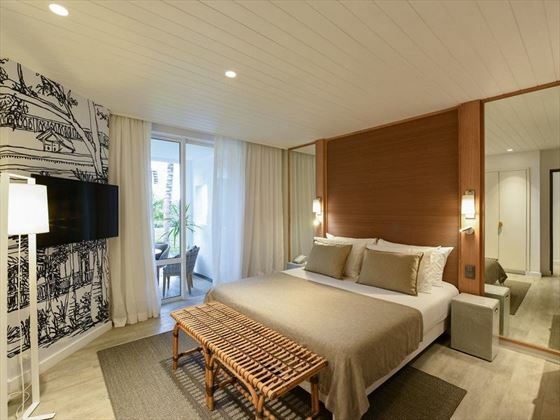 All of the rooms and suites are decorated with sustainable materials, with light wood and rattan furnishings adding a traditional Mauritian vibe, and large windows bringing in a heavenly glow of natural light. There are two categories perfect for families, including the Family Duplexes with their cool mezzanines creating a den for little ones, and the Family Apartment with its dining and relaxation area and two bedrooms. This fabulous resort certainly has kids in mind. The kid’s club has a wonderful and varied activity schedule that changes every day, giving young ones the chance to learn Creole, make their own masks, and even hunt for sweets. After they’ve worked up an appetite, wander along to Le Frangipanier and let the kids dine at their very own buffet, with a secluded seating area so they can have dinner with their new friends. Meanwhile, the spa built into the branches of a banyan tree is the perfect escape for adults to enjoy a serene treatment, giving you the time and space to reconnect and rejuvenate after a day of water sports. We love Le Navigator, a tranquil restaurant set away from the main resort and serving up a delectable menu of seafood caught straight from the sea. There are two terraces to choose from, but our favourite seat in the house is right on the sand, where you can listen to the waves lap against the shore. 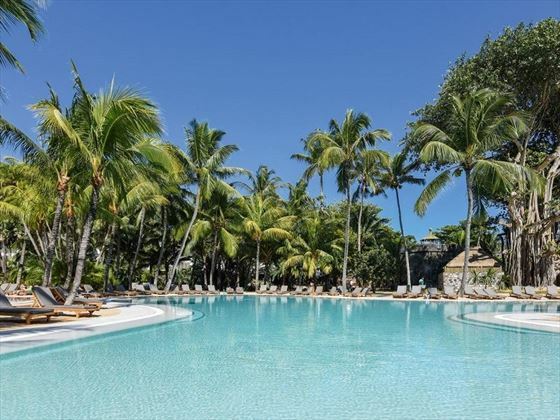 Located between the small towns of Trou aux Biches and Grand Baie, this luxury resort is blessed with incredible views of the Indian Ocean, with the main facilities and rooms just steps away from the pristine sands. Protected by a myriad of creeks, the resort benefits from a secluded ambience, with impressive views over the northern islands. Standard Garden – Charming 24sqm rooms, benefitting from gorgeous natural light from the terrace or balcony. The furnishings created from natural materials including wood and rattan adds a trendy and spacious feel, and marries beautifully with the uninterrupted views of the garden outside. Sleeps up to two adults and one infant. Superior Garden – Light interiors and large paintings of local scenes adds a unique touch to these 28sqm rooms. Each room features its own small indoor living area, which leads on to a terrace or balcony with lovely views of the gardens, pool or beach. Sleeps a maximum of three adults, or two adults and one child. Standard Sea Facing – Stylish 24sqm rooms evoking a welcoming atmosphere with its minimalist, sustainable sourced furnishings. Depending on your room’s location, you’ll likely be met with an uninterrupted view of the lagoon. Sleeps three adults, or two adults and one infant. 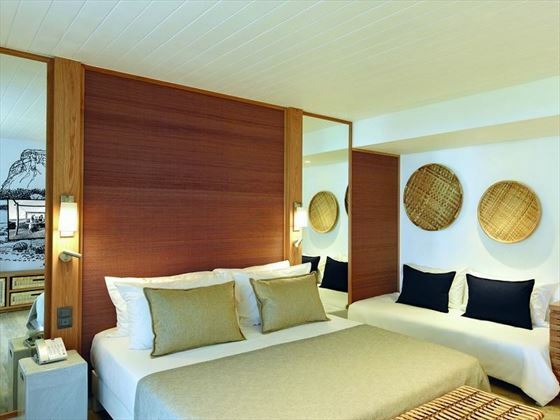 Superior Sea Facing – Elegant 28sqm rooms, featuring light and minimalist interiors for a spacious feel. Each room has a small, cosy living area and a terrace or balcony with gorgeous beach views. Sleeps up to three adults, or two adults and one child. Deluxe Sea Facing – These larger 50sqm rooms offer more privacy, with stylish Vincent Sheppard furniture and breezy interiors. The open-plan layout adds a feeling of space, featuring a large terrace overlooking the sparkling coves. Sleeps a maximum of three adults, or two adults and one child. Suite – These expansive 50sqm suites have all you need for a romantic getaway. The light, airy interiors add a tranquil ambience, as does the secluded location in a corner of the resort. The suites are open-plan, boasting a living area and a private terrace that looks out onto a string of dazzling bays. Sleeps two adults. Family Duplex Garden – These 32sqm rooms are ideal for families, located at the heart of the resort and boasting a staircase that leads to a mezzanine especially designed as a private den for the kids. There’s also a large terrace for time together outdoors, either opening out onto the tropical gardens, or just a few steps away from the main beach. Sleeps a maximum of two adults and three children. Family Duplex Sea Facing – Located by the main facilities including the kid’s club, these 32sqm rooms feature the same amenities as the Family Duplex Garden rooms, with the added glamour of sparkling ocean views. Family Apartment – Huge 80sqm apartments ideal for large families, providing space for privacy, as well as living areas for family bonding time. The light, natural materials make the apartment feel even more spacious, and the apartment features its own dining and relaxation area that opens out onto the gardens. Also boasting two bedrooms, two bathrooms, and a large terrace. Sleeps a maximum of five guests. 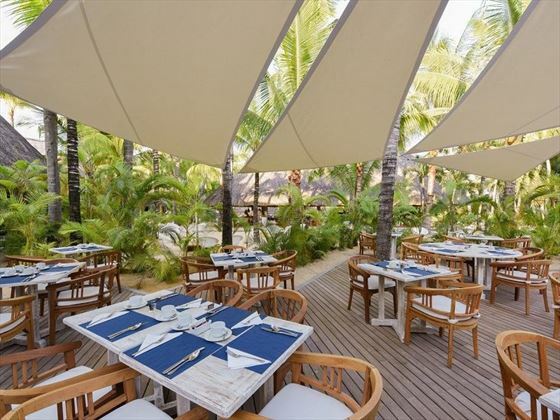 Le Frangipanier – The resort’s main restaurant, nestled right by the pool and shaded by coconut trees. This eatery offers a delightfully diverse international buffet, open for breakfast, lunch and dinner. 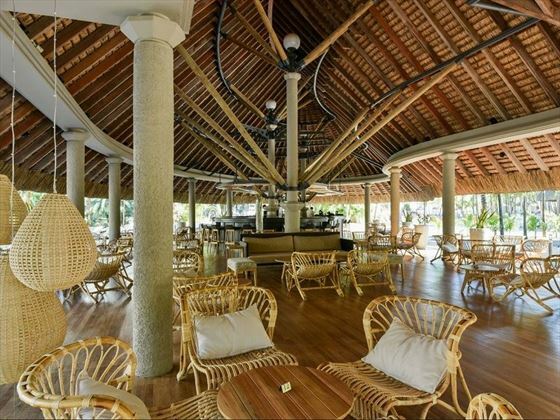 There’s two thatched pavilions to sit under, as well as an expansive terrace for wonderful al fresco dining. There’s even a dedicated area for children aged 3-12, with their own little buffet and child-sized furniture. Open 7.30am-10am, 12.30pm-2.30pm, and 6.30pm-9.30pm. Le Navigator – Perched away from the hotel’s main areas, this beautifully relaxed a la carte, fine dining restaurant offers seclusion as you dine. Set on a rocky promontory, the scenes of beach and ocean is a welcome view as you dine on gourmet seafood dishes. The restaurant is inspired by ancient colonial mansions, with two split-level terraces including one with tables on the sand, and the other looking out to sea. Open 12.30pm-2.30pm, and 7.30pm-9.30pm. La Serenata – This cosy dining space is open six nights a week, boasting a delectable menu of Italian favourites and a secluded ambience. A bamboo screen protects that guests from view, yet allows them to watch the hotel’s evening entertainment if they wish. Open 7.30pm-9.30pm. 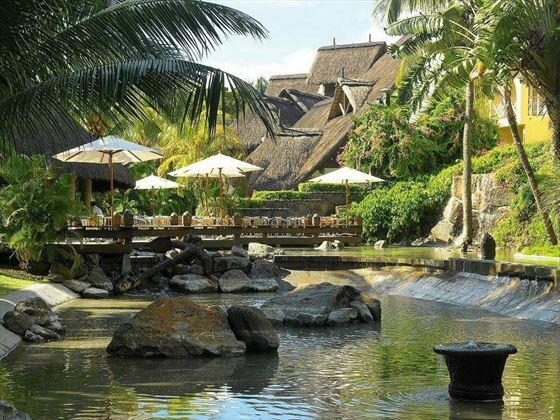 Le Planteur Bar – A casual and tropical bar, bordered by cascading pools one side, and the main pool on the other. There’s also a small amphitheatre where you can watch live performances by Mauritian artists each evening, best enjoyed with a cocktail in hand. Open 9am-11pm, with sandwiches on offer 10am-4pm. Canonnier’s kids club is a popular spot for little ones to explore and have fun with new friends. Every day there is a new activities schedule for the kids to enjoy, including mask making, cookie baking, learning Creole, archery, and even a treasure hunt where they can eat all the sweets they find. There is also a playground, indoor games, and all kids receive a gift on arrival. Open 9am-9pm, available for children aged 3-12 years. Children under three can stay with an adult. There are two room categories we would recommend for families. The Family Duplexes have a mezzanine for children, whilst the expansive Family Apartments feature two bedrooms and two bathrooms for extra privacy for all. Situated just off the reception, the baby care room has all you need to keep you little toddlers happy, including a bottle warmer, a changing table, and a fridge filled with yoghurts. The natural beauty of this spa lends itself to an even deeper sense of serenity and seclusion. Built in the branches of a banyan tree, this tropical hideaway evokes an authentic Mauritian ambience, with six treatment rooms and sustainable therapies including massages, facials and manicures. The rustic cabins are built at different levels, adding to its sense of privacy, and all feature their own outdoor showers for an additional treat. Overall, this spa offers a journey of well-being and reconnection, leaving you feeling rejuvenated in mind, body and spirit. 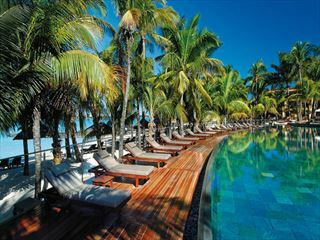 Mauricia Beachcomber Resort & Spa is located in busy Grand Baie. It is a really lively 4 star hotel with lots of land and water sports. There are great bars and restaurants in the hotel and on your doorstep - excellent value for money.